“This is when it starts to get real,” trainer Jason Baker said to about 40 people holding the plank position on the opening night of an ongoing fitness program open to the community. Earlier this month, Baker and his crew launched the 805 Project, a weekly donation-based guided workout for all ages and fitness levels. “It’s a win-win,” one participant said. “You get to give back to your community while giving back to yourself.” For the first three months, all donated proceeds from the weekly workouts will be given to the Santa Barbara Bucket Brigade disaster-relief nonprofit. This summer, Baker’s team will select a new nonprofit to receive the proceeds. Amid hoots, laughter, and high-fives, Baker and his crew — including wife Wendy Baker, plus Emily Carey, Jessie Hernandez, and Ashleigh Vargas — led the group through fitness stations for a full-body workout. These activities included a run around the park, step-ups, ball slams, squats, presses, and rows with resistance bands. Participants did it all accompanied by swaying palm trees, birdsong, and glowing afternoon sunlight. “We’ll definitely be back next week!” said Richard Gonzalez, who brought his young son and daughter to the workout. Gonzalez began training with Baker eight years ago. 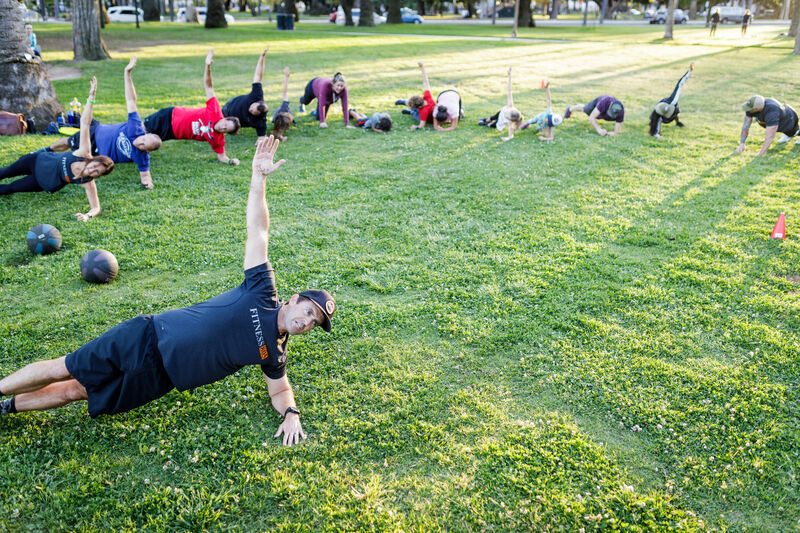 The donation-based 805 Project workout meets every Tuesday at 6 p.m. at Alameda Park, near the corner of Sola and Garden streets.